Remember when I swore I would never read on an e-reader? Well, I guess I lied. 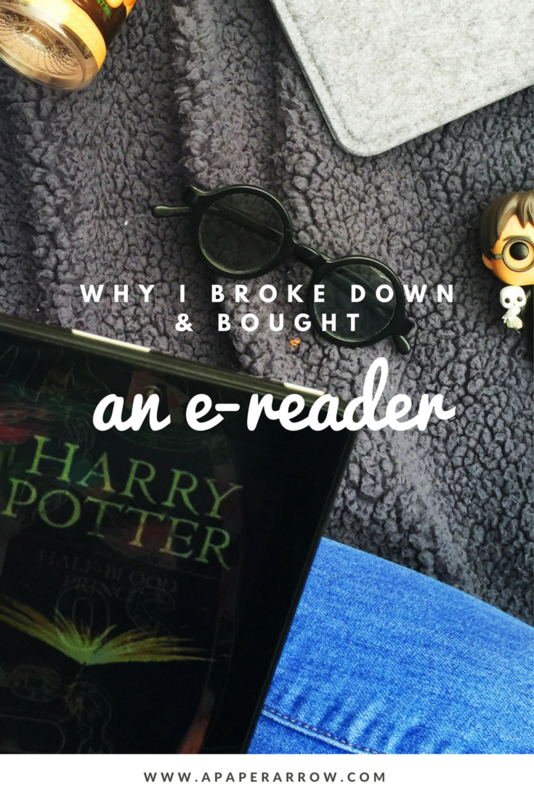 Why did I buy an e-reader? While I am a member of several programs that supply Advanced Readers Copies (ARCs) of books, I noticed several of them started switching to e-books only, which was a real bummer. I still prefer a physical book, but it seemed necessary to have a e-book supported device so I could occasionally read some ARCs I was very interested in. Which e-reader device did I purchase? Amazon had their Amazon Fire tablet on sale for $33 on Black Friday, so I snatched one of those up. I figured it would be a nice first tablet because it also has internet capabilities and supports apps. Unfortunately, the tablet doesn't support most apps I was interested in downloading. I was hoping to use the tablet not only for reading, but also mostly for blogging on-the-go. That didn't work out so well. The tablet does not work well with Blogger, or with a lot of sites that aren't connected to Amazon. I can download the books I've sent to my kindle as "documents," however, other apps I needed to download ARCs weren't compatible with the Fire. That was obviously a huge bummer, so me and my Fire aren't best friends. I think if you're purchasing e-books through Amazon or borrowing from Kindle, this is actually a pretty good platform to read on. I really enjoy the Kindle app. You can view how much longer you've got left in the chapter or the book, gauge your reading speed, and more. I really like that you can highlight words or quotes for more information (don't know what that word you just read means? You can quick search the definition using the highlighting option!). There's also the option to turn off the backlight, so as not to strain your eyes when you're reading in the dark, which is pretty cool. Does anyone have any suggestions for how to make the Fire more compatible for the uses I'm looking for? Maybe I'm still not a huge fan of e-reader devices. Honestly, since I received my tablet in late November, I've only read two e-books - Little Heaven and The Bone Witch - and I read those going back and forth between my phone and my tablet. It's nice that I can switch between devices and still pick up where I left off, so I definitely enjoyed that about the Kindle app. Honestly, I will forever prefer physical books. I've noticed it takes me a couple weeks to read a book via e-reader, when I can finish a physical books in a couple of days, on average. So, when given the option, I will always choose the physical book, but I guess it doesn't hurt to own the tablet, too. What are your thoughts on reading e-books? Which format do you prefer? This post includes affiliate links. If you click on one of my affiliate links and make a post, I will make a small commission. They had the Fire for $33? :o That's crazy! I have a Kindle...the one with the keyboard that is super old. I don't really use it unless I'm traveling or there's a book that I'm just really impatient for, but it's definitely nice to have around! Yes! It was super cheap, so I was like "couldn't hurt to buy it," but I truly get so aggravated every time I use it. Lol. And I agree - I don't really use mine alone, except for ARCs. I prefer reading from paperbacks but I might need to try an e-reader. They are so affordable now! I agree with you! Paperbooks, to me, are the fastest and easiest way to read! I definitely prefer a book too, but these are convenient. I love mine when I travel and can have multiple books on it. I do find myself reading an actual book faster when I'm around the house though. I agree. I'm bad about even carrying it with me for travel! I just have a hard time reading electronically. Weird, I know. I was sold on kindle reading once I got mine. I actually read a physical book recently for the first time in a long while. I had the old black and white kindle originally and now I have the kindle fire. Whilst it's not a device you would rely on as your sole computer it is handy when you are away and still wish to go online. I also find it really useful for watching catch-up tv and Netflix. All those apps work really well. I definitely agree with you! There is just something so wonderful and comforting about the physical book. I do hear a lot that the e-readers are wonderful for travelling, which makes a ton of sense!